Glock 48 VS Glock 43X | Which Glock Is Best For Your Daily Carry? Another year brings us another Glock! Not that that is a bad thing. Glock has always been slow with introducing new guns, but in the last few years they’ve stepped on the gas and propelled towards bringing out new guns every year. This year gave us the first introduction of two guns at one time, both sharing a ton of similar features. They are both thin, single stack guns with a similar finish, and they are in the same caliber. It was at the biggest firearms industry trade show in the world, SHOT Show that we got our first hands-on with both guns. At the Industry Day at the Range we were able to put lead downrange with both guns, and later at the show, we could run our grubby little hands all over them. I spent more time that I thought I would with both guns. Admittedly neither pinged my interest before SHOT and I went to range day just to see what all the buzz was about. Now as a self-professed internet gun expert I am rarely wrong, but this time I was happily wrong. With both range time and handling time down, I feel like we need to compare the two and identify the strengths and weaknesses of both platforms. Both guns are the famed polymer Glock frame. With standard Glock stippling. I am really glad they went with the Gen 5 grip without finger grooves. It seems to be a staple of the single stack series. It looks cleaner and more robust. The gun looks good and is lithe. They are identical when it comes to fit and finish. Glock is a master of mass production, and it shows in these two guns. Everything is clean and well designed and well cut. Both guns utilize the same exact frame, and the big difference is the slide. The Glock 48 overhangs slightly over the edge of the frame. Love it or hate that’s just how it is. Mass production is a lot easier when you are making two frames for one gun. Both guns have a silver or stainless steel colored PVD finish. I spoke with Glock at SHOT Show, and the PVD finish was chosen for a couple of reasons. First, the finish is tough and extremely resistant to salt and corrosion in general. This is critical because the gun will be pressed against the body and exposed to sweat when it is being carried in deep concealment. The finish was also chosen because it is eye-catching. Stainless always looks better than black, and the G48 and G43X are certainly eye-catching guns. They stand out in a sea of black slides and black polymer grips. What’s also interesting in terms of fit is the presence of front serrations on the guns. Like the G45 this is a new addition that might become standard sooner than later. Both guns look great, and the G43X may look better to some. The G43X’s slide ends at the frame, and this does present an overall cleaner look in my opinion. As similar as these two guns are they do diverge a bit more when it comes to their specs. They do share a few specs as well. For example, both guns have a 10 round capacity, and both guns are in 9mm. They also both have the same overall height due to the fact they use the same grip, so they are both 5.04 inches tall. The same frame equals the same thin width at only 1.10 inches wide. It’s wide enough to grip and thin enough to conceal easily. The barrel length and then the overall length is where we see a number of differences. The G48 is the bigger gun, and it has a 4.17-inch barrel length. This is a little longer than a Glock 19 barrel and totals 106mms which luckily enough makes it long enough to import into Canada who has a 105mm barrel length requirement. The overall length is 7.28 inches. The Glock 43X is identical to the Glock 43 when it comes to length. The Glock 43X has a 3.41-inch long barrel and an overall length of 6.5 inches. The shorter the barrel and slide mean you have a shorter overall sight radius, which makes the gun harder to shoot accurately. However, the shorter slide and barrel means the gun weighs 2 ounces lighter than the larger G48. The shorter length also makes it easier to carry and slightly faster to draw. The Glock series of handguns all have very similar ergonomics. The longer grip of these two guns means they are easier to hold and easier to control. This makes the entire setup much more comfortable. Both guns also have a bit of a lip or beavertail to keep the slide from riding the hand and causing slide bite. The magazine catch of both guns is reversible and can be set up for right and left-handed shooters. The design incorporates the standard Glock slide lock that’s actually somewhat small for any gun. Neither pistol has a manual safety and instead, you get a small trigger safety that keeps the weapon from firing until the trigger is fully pressed. Both guns have front slide serrations so you can press check the gun and double check to see if there is a round in the chamber. On the Glock 48, the longer slide makes me feel more comfortable when it comes to press checks. It’s very easy to flag yourself with the 43X when you attempt a press check. The larger grip makes it easier to eject the magazine in my opinion. With small guns, the magazine will often catch on my hand and fail to drop fully. The longer grip will allow you to drop the magazine freely. Beyond that, the overall design of both guns is well valued and suited for easy control when the weapons are fired. The Glock 43X and Glock 48 share the same features. The gun is not necessarily a known generation in the Glock world. Typically a Glock pistol will be part of one particular generation, and this ranges from Generations 1 through 5 with the 5th being the current generation. Glock models like the G42, G43, and now the Glock 43X and G48 fall outside of these typical generations. Like the Gen 1, 2, and 5 models the G43X and G48 have smooth grips without finger grooves. This is a major improvement in my eyes. The guns lack a rail, but this makes sense because the guns are designed to be concealed carry guns. Lasers and lights add mass and weight to a gun. The guns have the first built in beavertail for Glock pistols, and Glock needs to incorporate this into every single one of their guns. It really makes these guns more comfortable to shoot. I hate slide bite, and Glock gives it to me, especially the small ones. The Glock 43X and Glock 48 will be equipped with the Generation 5 Glock Marksman barrel. The Glock Marksman barrel is a match grade barrel that is exceptionally accurate and lends to the gun’s mechanical performance. The magazines are both ten rounders and have the same generation 5 high visibility follower. This allows you to look through the witness holes of the rear of the magazine and see the bright orange follower. When I got my chance to hit the range with the G43X and G48 I was pleasantly surprised. I had fired the 43, as well as numerous pocket pistols and found the G43X and G48 to be pleasant shooters. That longer grip helps reduce felt recoil which makes the gun so much more pleasant to shoot and to control. Shooting fast isn’t just fast, but it’s accurate as well. The beavertail included into the frame is an absolute dream and makes these guns a lot more pleasant to fire than most Glocks. My main problem with Glocks is I get slide bite, and the addition of those grip beavertails is great, but they are bulky. The integrated Beavertail into the G43X and G48 need to become a stock Glock option. This beavertail also provides leverage when it comes to shooting and gives you greater control of the gun. The Glock 43X has slightly more snap to it, and the shorter barrel has a bit more muzzle rise. It is noticeable but not uncontrollable. The 43X is still a straight shooter, and much easier to handle than the standard 43. The Glock 48 is basically a single stack Glock 19, and this means its already superbly easy to control and to handle in general. It fits the hand brilliantly and is just perfect for my big hands. This gun shoots a little smoother and is easier to shoot accurately at longer ranges. The Glock 48 is slightly easier to shoot, but the 43X is much easier to shoot than the 43. The 43X is, of course, the smaller gun so this isn’t unexpected. The Glock 48 is slightly longer than the Glock 19, and I mean just a hair. These dimensions have long been considered the perfect compromise for a concealed carry gun and easy to control weapons. The Glock 48 is much thinner than the 19 and therefore it easier to conceal, especially when it comes to IWB carry. However, when compared to the Glock 43X the Glock 48 is longer and heavier. The Glock 43X is the easiest to conceal, and more comfortable of the two. The shorter barrel makes IWB way more comfortable than the longer barrel of the 48. The Glock 43X’s shorter barrel doesn’t poke, especially when it comes to appendix carry. The G48 is great for IWB but to me its a better OWB gun. The thin design of both guns makes them a solid and easy to conceal weapon. When it comes to the magazines these small single stack guns have thin single stack magazines, they are very easy to conceal and carry. Toss them into the right pouch, and they’ll disappear on your body. The larger grip of these guns adds a layer of complication when it comes to concealment. A larger grip is harder to conceal but makes it a lot easier to get a grip and draw the weapon from concealment. The 42 and 43 could be used as pocket pistols, but the 43X and 48 are much too large for that role. If you want an easy to carry appendix carry option or you are a person with a smaller build go with the G43X, but if you want something easier to shoot that can be comfortably carried OWB and IWB then the G48 is the choice for you. Glock’s newest foray into concealed carry guns has been controversial. The designs for both guns are different than most concealed carry pistols. They don’t try to be pocket pistols. 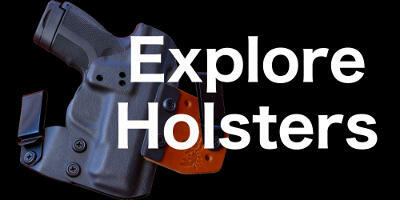 Instead, they are concealed carry pistols that are also comfortable to shoot. The pocket pistol genre is easy to conceal, but hard to shoot accurately. These guns are designed to be easier to shoot and easy enough to be concealed. Their thin nature makes them comfortable to carry, especially in an IWB configuration. The Glock 43X and 48 are designed to take a different route than the traditional pocket pistol. The Glock 42 and 43 series are designed to be your traditional micro-sized pocket pistols, and the 43X and 48 are designed for those who want something a little bigger and easier to handle. Glock handguns are built to last and are easily some of the most reliable guns on the market. A lot of people jumped out and hated the Glock 19X when it premiered, and yet they’ve sold over a 100K Glock 19Xs in a year. I don’t doubt the Glock 43X, and 48 will be big sellers. In all honesty, my favorite is the Glock 48, and I might add one to my collection if Glock added an optic’s ready option to the G43X I might have to grab one of those too. The Glock 43 has served me well. I think I’ll check out the 43X. Not sure if the Glock 48 is necessary. If I want a longer barrel, I already have my G19. I like the idea of the Glock 48. I’m not sure how well it would work out in my CCW rotation though. If I want 10 rounds, would I prefer the G26 or the 48? Hard to say without using them both but I’d bet my G26 would still be my go to gun. I’m drooling over the Glock 48. I LOVE the Glock 19. Yet I don’t carry it often because the grip pokes out. I’m betting I can carry the Glock 48 much easier. Got one last week. Shot it last Friday. Sold my 43 to my shooting partner. We’re both happy. Oh, the 48 is a flawless sweet shooter. I carried the Glock 22 for 15 years until our department switched to the S&W M&P. I’m retired now, and my EDC has been the 43. The 48 just took its place. Sadly, my Clinger holster for it arrived in the mail after I got back from the range. Well, there’s always next week to work with it. Now anxiously waiting for some spare mags to become available. Get one – if you like Glocks, you won’t be sorry. Got the Glock 43X and a Clinger V3 ultra conceal OWB. Love the small Glock and the Clinger holster couldn’t fit better, both the 43X and myself.